Of all the optical phenomenon in every day life, the rainbow is loveliest. Reflection of sun light by the rain drops is certainly an essential element of an explanation but refraction-plays a role, too. The circle represents the cross section of a spherical rain drop. For the light ray, the sequence is Refraction, Reflection, and Refraction. The angle (less than 90o) between the incident direction and the emergent direction is called as "Return Angle". A Ray from the sun strikes the spherical rain drop and some light is refracted into the water. Here we may ignore the portion that is reflected by the drops' surface. Next, the Ray proceeds to the far side of drop and is reflected there. Now we may ignore the portion that is refracted. Finally, the ray strikes the underside of drop and is refracted out into the air. In precisely which direction does the emergent ray travel? suffice for answering that question. 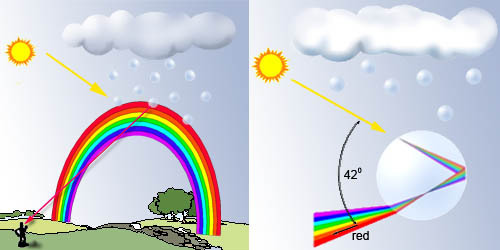 Once the initial point of contact between the rain drop and the ray from the sun has been specified. 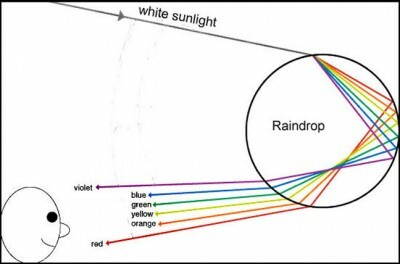 Also because the index of refraction depends on color, we must specify the color of light. Lets start considering Red. Working out the complete path for many rays-i.e. for many different initial points of contact-reveals a surprising geometric property: The return angle for red light never exceeds 42.5 deg C, and most rays have a return angle 42 deg. So return angle will decide the color of light reaching our vision of sight. Hence, different colors emerge from different sets of rain drops and produce a colored Rainbow.